A Day in Her Shoes is a wonderful opportunity for women to get together for a glamorous evening to promote mental wellness while supporting a fundraiser for much needed mental health resources in the greater Saint John area. Hors d’oeuvres, wine and other beverages, and a silent auction accompany the season’s best fashion show, which takes place in the Market Square Atrium. The latest in spring fashions from Manchester Shoe Salon, Samuel & Co, Inspire Collections and Walsh Luggage, and hair and make-up by Element5 Spa will be featured. 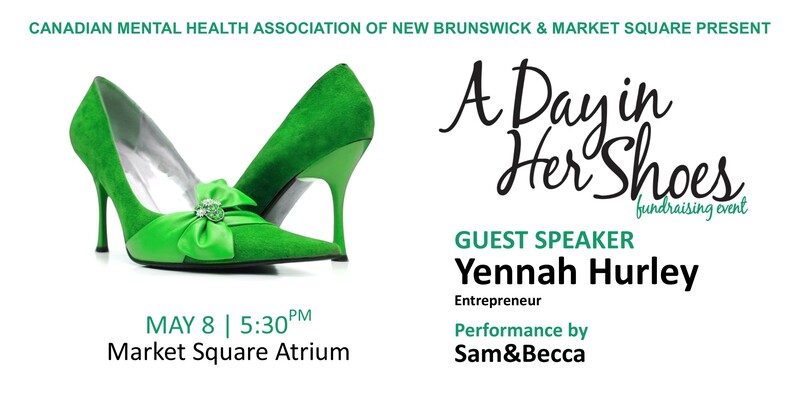 The Canadian Mental Health Association (CMHA) of New Brunswick, Saint John office is pleased to announce this year’s guest speaker is Saint John businesswoman and entrepreneur, Yennah Hurley. With a special musical performance by Sam&Becca. 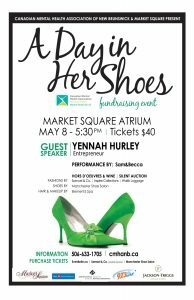 Tickets for A Day in Her Shoes are available at the CMHA of New Brunswick office in Hilyard Place (560 Main St, A315), online at Eventbrite, by calling 506-633-1705, and at Manchester Shoe Salon and Samuel & Co. in Market Square.